WTOP has reported that a man has filed suit against DC Police after officers allegedly seized a smartphone which he claimed he was using to photograph "police misconduct". Earl Staley, of Anacostia in Southeast D.C., attempted to use his smartphone to photograph Metropolitan Police Department Officers. According to the complaint "Mr. Staley and his friend saw an MPD cruiser hit a man on a motorbike near the corner of Martin Luther King Jr., Avenue, S.E., and Raleigh Street, S.E. The motorbike rider was thrown to the ground and appeared to be injured. Mr. Staley and other bystanders watched from the other side of Raleigh Street as two MPD officers from the cruiser began punching the man as he lay on the ground bleeding." on July 20 in Southeast, according to the suit. When Staley attempted, unsuccessfully, to photograph the incident... "The next thing he knew a hand reached over from behind his shoulder and grabbed his phone. He thought it was being stolen,"[...] "He turned around, and what he found was a police officer standing behind him, with his phone" says Staley. The suit alleges Officer James O'Bannon seized the phone and that officer, Kenneth Dean, told Staley he had broken the law by photographing officers. Staley got his phone back from the police station some hours later:"A lieutenant came out, told him it was a mistake the officer had grabbed it from him, apologized, and gave him back his phone," Spitzer says. "When he got home and took out his phone to take a picture of his little girl, the phone said, 'Insert memory card.'" Staley believes police removed the card and all the photos it contained. Police Chief Cathie Lanier told WTOP that she can't comment on the specifics of the case but that "the allegation in this case, if true, would have been a violation of our policy." 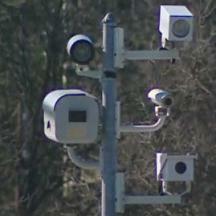 DC Police run a network of approximately 93 speed and red light cameras deployed at 178 locations, as well as a vast system of surveillance cameras, all of which photograph motorists with impunity.